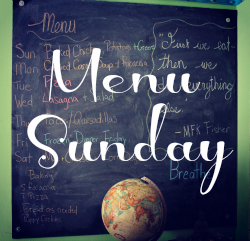 That Menu Sunday began close to the beginning of 2013, should not call to mind the yearly (and rather futile) practice of making “resolutions.” Resolutions are to my mind, a silly exercise in fantasy and wishfulness whereas Menu Sunday is the practical work of feeding my family. No fantasy or wishfulness there…unless you know a personal chef that will work for free and I’d be all about that. Instead, Menu Sunday is my attempt to create a space online that caters to families like mine – budget conscious people who aren’t the slightest bit interested in casseroles (the kids won’t touch them), reassembling already made things into something new, or otherwise already made food…things (mostly – we do like our blue box now and again). If you’re looking for anything that qualifies as “semi-homemade,” sorry, but you won’t find that here. What will you find? Meals that start with ingredients that require processing. Veggies including the wearily eyed, but wonderfully tasty greens. Bread of the sort you make from scratch. Meat I bought from the grocery store and that probably came from a feedlot, because I’m feeding five and I can’t afford ground beef that starts at $7/lb. Conventional vegetables. Food to eat, not food to heal. Food for real people who eat because they have to and because they might as well enjoy it along the way.